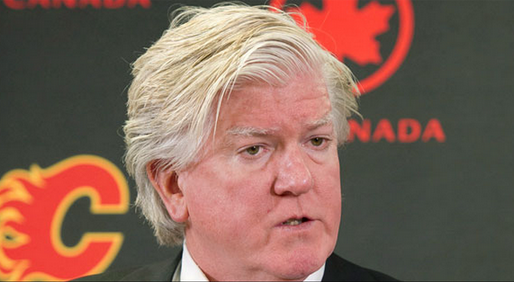 Yesterday, Ottawa traded prospect Jeff "definitely not Elvis so please stop asking" Costello to Vancouver for prospect Patrick Mullen. Also yesterday, the Senators placed Cory Conacher and Joe Corvo on waivers, presumably to clear up roster spots (read: dump trucks of cash) in order to make a bigger move come deadline day, although moving Cory Conacher doesn't clear much space. He's petite. Jump forward to today, where Conacher was claimed by Tim Murray and the Sabres. Joe Corvo went unclaimed, much like his shirt at the Sens charity gala. Nobody ever gave me a good explanation for shirtless Joe Corvo, but I will assume "all of the alcohol ever" was involved. Sens are throwing Joe Corvo to the Wolves....of the AHL. Jump back to this morning, where the Sens announced the re-signing of Chris Phillips to a two year contract worth $2.5 million per year, bringing new meaning to the term "stay-at-home defenceman." Rare sober thought: Fans, myself included, have been fairly critical of the organization's unwillingness to let Phillips go in the name of draft picks. It it should be pointed out, however, that the way an organization treats is veterans does not go unnoticed when it comes to luring free agents to town (or so I am told). After Alfie-gate, Ottawa needs all the help it can get in this respect, especially with that enormous "trade Spezza" avalanche cooooOOMING OUR WAY RUN! Ottawa makes a super-low-risk-probably-too-late-but-still-pretty-neat trade by bringing in Ales Hemsky from the Oilers for a 3rd and 5th round pick. It doesn't matter what year the picks are in because who's ever turned out from the 5th round before? 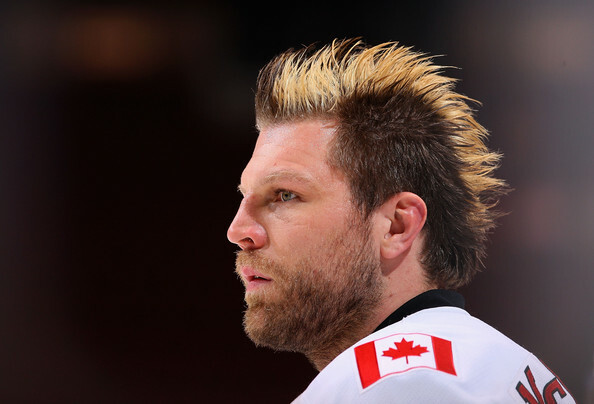 After years of nothing, this marks Ottawa's second "winger for Spezza" trade of the season. Expect Hemsky to show instant chemistry with Mika Zibanejad. If you'd like more/actual coverage of today's deals, Graeme Nichols of the 6th Sens provides a nice breakdown of all the moves today. Now let's see how those decisions pan out! 17:56 - On a Flames rush, the puck takes a weird deflection off Phillips's stick directly to Granlund in the slot. He bounces one off the ice and over Anderson's blocker to make it 1-0 Flames. Gretzky and Sundin nod in approval. 15:38 - Wiercioch called for tripping. Wierd ciall. 10:43 - Ottawa records their first shot. 9:02 - Smid takes a tripping penalty. 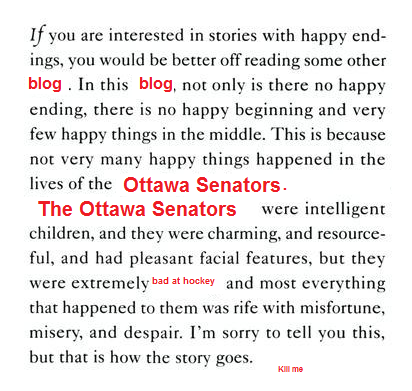 Ottawa exchanges their powerplay for future considerations. 6:45 - Ales Hemsky records his first shot on goal. Oreo(?) gloves the shot down easily, while Hemsky goes face first into the boards on his own accord. Hemsky appears to wince in pain as he gets up, but I wouldn't worry, that's just the crippling realization that he's an Ottawa Senator for the next 20 games. 0.0 - As per @ryanclassic, ice time after one period: Z. Smith (5:56), Greening (5:15), Hemsky (4:34), Neil (4:05), Ryan (3:59). 15:58 - Paul Byron almost scores on a 2-on-2. This GIF comes courtesy of Travis Yost. Watch Michalek and Karlsson. To describe their backcheck as "lethargic" would be generous. I've read at least 50 books in my life and even I can't explain what's happening with this team. 10:30 - Paul Byron scores for the Flames to make it 2-0 Calgary. Story time! I went to hockey camp with Paul at the Nepean Sportsplex when I was like, 10 years old probably. I taught him everything he knows about drinking copious amounts of All Sport. It was my first year of playing hockey and I was completely horrible. Brian Kilrea showed up as a surprise at the 3rd day of camp and couldn't believe his eyes as he watched me try to skate backwards. I couldn't do it at all. I was a mess. It was like watching Matt Kassian trying to pull off the Datsyuk with Bambi's legs. Kilrea was outraged. I was fairly terrified, but it quickly became apparent that Kilrea wasn't outraged at me, but at the coaches that let me struggle through skating backwards circles over the entire ice surface for 3 straight days without giving me any instruction. Kilrea took me aside and spent a solid 15 minutes trying to help me out. Let's pretend the story ends with me becoming a competent backwards skater. ??? - Bobby Ryan fights??? Here's a somewhat glitchy GIF. 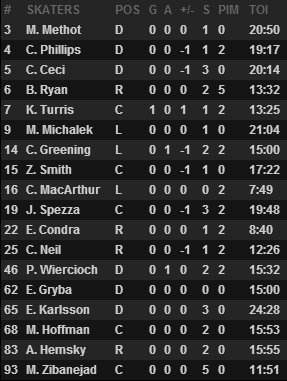 Smart of Bobby Ryan to fight given that he was going to spend the next 5 minutes on the bench anyway. 2:17 - Former Leafs prospect Joe Colborne scores to make it 3-0 Flames. I start Googling pre-season cup predictions. 0.0 - All fragile objects in my apartment are much more broken versions of their previous selves. 19:41 - Clarke MacArthur hits Jiri Hudler, who slides awkwardly into the boards. For some reason this results in a brawl involving Erik Condra and Kyle Turris. J.R.R. Tolkien is jealous of the creative imagination of this game. 18:00 - Ottawa gets a power play for whatever reason from the brawl and Chris Neil is sent out on the PP. J.R.R. Tolkien, watcher of 0 hockey games, dissents on this coaching decision. 8:38 - Untradeable UFA Mike Cammalleri scores to restore the lead back to 4-1 Calgary. I wish I had something positive to say. We're at the "slow pan over the bench as players hunch over the boards" point of the season. This was one of those "do or die" scenarios and they fell flat on their faces. The coaching was atrocious, the players were atrocious, and my jokes were atrocious. 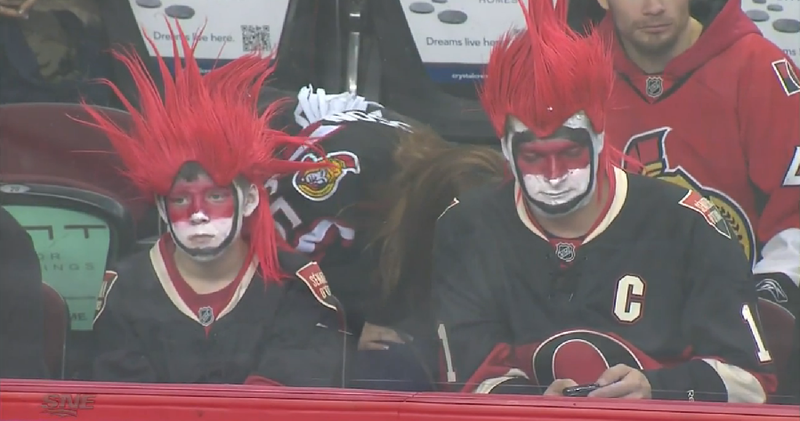 I'll leave it to my two favourite fans of the night to sum up this performance.